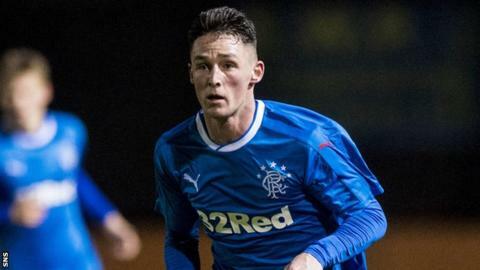 Rangers midfielder Jordan Thompson has joined Livingston on loan until the end of the season. The 21-year-old, whose Ibrox contract ends this summer, has made three first-team appearances for Rangers. But his last game for the Premiership club was in July 2016 and he spent last season on loan to Raith Rovers. Livingston manager David Hopkin said: "He trains with Rangers' first-team squad and has been on the fringes of the first team for a few seasons." Hopkin moved for the Northern Ireland Under-21 international after Partick Thistle recalled James Penrice from his loan at Almondvale. Livingston earlier this week also sent midfielder Craig Henderson on loan to Cowdenbeath - and the 16-year-old was on the bench for Tuesday's League Two draw with Montrose. Thompson, who has a previous loan spell with Airdrieonians, played against Livingston last season, making 32 appearances as Raith Rovers were relegated from the Championship. "We have been searching for a left-sided centre midfielder since we found out the Partick were taking James Penrice back," Hopkin told his club website. "Jordan comes highly recommended from the management team at Rangers and various other sources that we tap into. "He has international experience with Northern Ireland and Championship experience with Raith Rovers last season. "He is also versatile in that he can play left-back and left-wing back. "Jordan has a cultured left foot and will provide a different dimension to what we have in our squad just now. "Hopefully we can push his development on in a similar fashion to James Penrice breaking into Partick Thistle's first-team squad after his loan spell with us." Thompson goes into the Livingston squad for Saturday's Championship game at home to Queen of the South.